In the last few years, ConvertKit has emerged as the go-to email marketing tool for professional bloggers. Some of the most prominent bloggers have made the switch from AWeber or other popular email services to ConvertKit. But what is so special about ConvertKit that made these bloggers switch from their trusted email marketing service provider (ESP)? As the company proclaims throughout their website, ConvertKit is an email marketing company built by bloggers for bloggers. The company takes this motto seriously as most of its features are streamlined for bloggers who are serious about growing their email lists. In fact, ConvertKit seems to do most things right in a quick and efficient manner. But there are still a few areas where AWeber has an edge over newer services like ConvertKit. Once a leader in the email marketing space, AWeber has gradually lost its market share due to its lacklustre user interface and unimpressive updates. Regardless, AWeber continues to assert its dominance in the email marketing space, enjoying a market share of 5.09%, making it the third largest email marketing service in terms of market share. This is no small achievement, considering there are 165 email marketing services in the market at the time of writing this article. On the other hand, ConvertKit’s market share is less than one percent. So clearly they have a long way to go before they can even come close to AWeber’s share of the market. Now, let’s compare these two popular email services to help you decide which service is more suited for your requirement. This article will not follow the regular review comparison template we use at 99signals. Instead, it’ll follow the comparison template we used for the MailChimp vs ConvertKit article. We’ll reveal top 5 reasons why one may choose ConvertKit over AWeber and 5 reasons why one may opt for AWeber. Let’s get started! Until ConvertKit came along, AWeber’s autoresponders were considered the gold standard in email automation. In fact, AWeber had built a reputation around email automation. All that changed with the launch of ConvertKit with its simple, yet powerful automation builder. The advanced automation features of ConvertKit are what sets it apart from other ESPs on the market. ConvertKit provides a visual automation builder which allows you to send well-timed, targeted content to your email list. 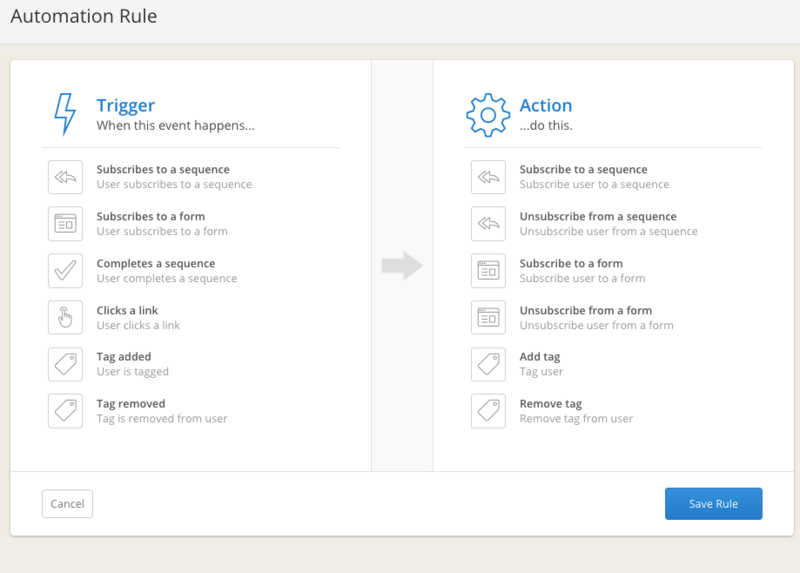 More importantly, you can customize a subscriber’s path based on their actions on your site and segment your audience based on their customer journey. In comparison, ConvertKit’s user interface looks clean and elegant, making it easy for new as well as advanced users to understand all the important features. 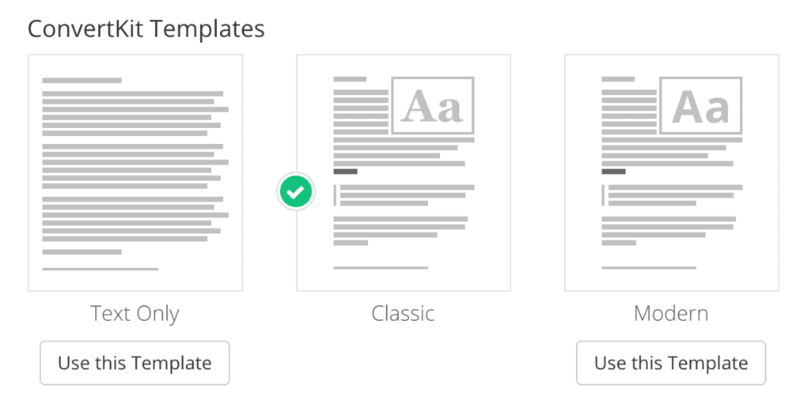 In regard to email templates, you get to choose from three types: text, classic, and modern. When it comes to the design of these email templates, ConvertKit focuses more on simplicity and less on intricacy. Their templates are not over-styled and lack design elements that may compromise the readability of emails. In fact, ConvertKit makes a strong case for why beautiful email templates can hurt your business. ESPs are generally not known for the design of their sign up forms and landing pages. Nonetheless, the ability to create well-designed signup forms and landing pages is an added bonus. And ConvertKit provides these features to its users. 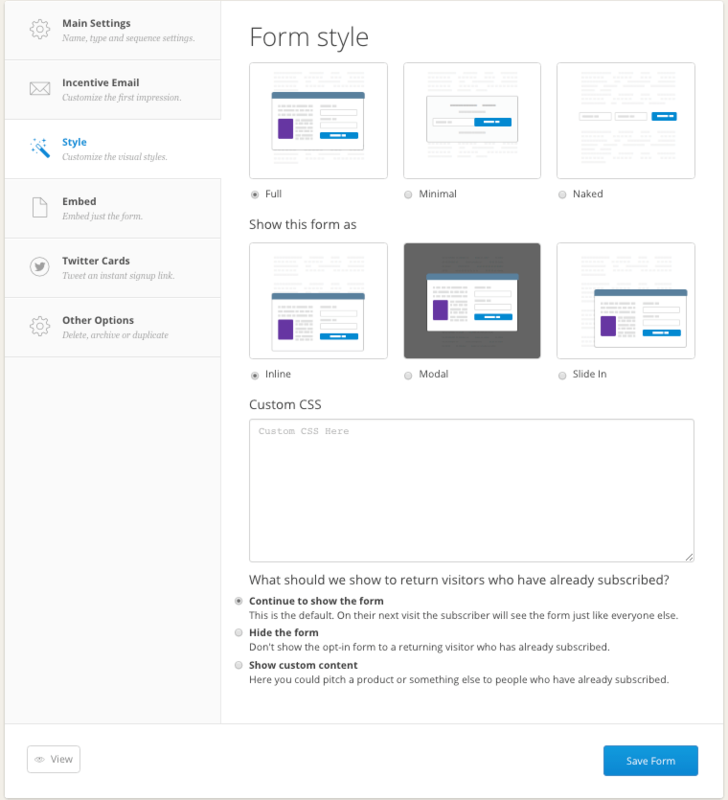 The sign up forms and landing pages are not as good as the ones you’d find on Sumo or GetSiteControl, but if you don’t use a separate software to create opt-in boxes and landing pages, then you’ll probably be satisfied with what ConvertKit has to offer in this department. The first thing you’ll notice after setting up your ConvertKit account is the ease at which you can go about your business. This is true even if you’re just starting your email marketing journey with ConvertKit. In fact, you can join ConvertKit Beginners Facebook Group to get answers to any email marketing question that you may have. If you’re an advanced user migrating from another service, ConvertKit has guides to help you through the process. If you have over 5,000 subscribers, you can opt for their concierge migration service where ConvertKit’s team does the migration on your behalf to make the move as seamless as possible. Unsubscribers are automatically dropped and inactive subscribers are automatically highlighted for removal or re-engagement. For a platform that claims to be built for bloggers, ConvertKit sure does feel like a premium service. Being relatively new in the market and competing with widely popular services like MailChimp, Constant Contact, and AWeber, one would naturally assume ConvertKit would lower its prices to entice news users to sign up and advanced users to switch. Sadly, this is not the case. AWeber is considerably cheaper than ConvertKit if we were to take their list-based pricing into account. For comparison purposes, let’s say you have decided to go for a new email marketing software and you have around 4500 subscribers that you need to import. If you choose AWeber as your email platform, you’d have to pay a monthly subscription fee of $49. In contrast, you’d have to pay $79 if you choose ConvertKit as your preferred email software. For a service that’s been around for years, AWeber still manages to price its tools competitively and is hence a more practical solution for bloggers who are on a shoestring budget. Email marketers know the importance of email marketing analytics. Nevertheless, tracking the performance of your email campaigns can be extremely complicated. That’s not the case with AWeber. With AWeber, you can track everything from open rates to sales with a few clicks. You can even segment your email list based on open rates, purchases and more. This is not to say ConvertKit’s email analytics capabilities are bad. It’s just that AWeber makes it so easy to use and understand. Despite its dwindling market share, AWeber continues to garner incredibly positive ratings and reviews on software review sites such as G2Crowd, Capterra, and TrustRadius. Despite receiving rave reviews and endorsements from popular bloggers, ConvertKit has not been able to generate enough reviews on the same sites. One could argue that ConvertKit is relatively new compared to AWeber, but their average rating is only marginally higher than AWeber’s on G2Crowd, and they have no reviews on Capterra and TrustRadius. At the time of writing this article, AWeber is rated 4.3/5 on G2Crowd (306 reviews), 4/5 on Capterra (42 reviews), and 7.3/10 on TrustRadius. In contrast, ConvertKit is rated 4.4/5 on G2Crowd (43 reviews), but is yet to fetch any reviews on Capterra and TrustRadius. 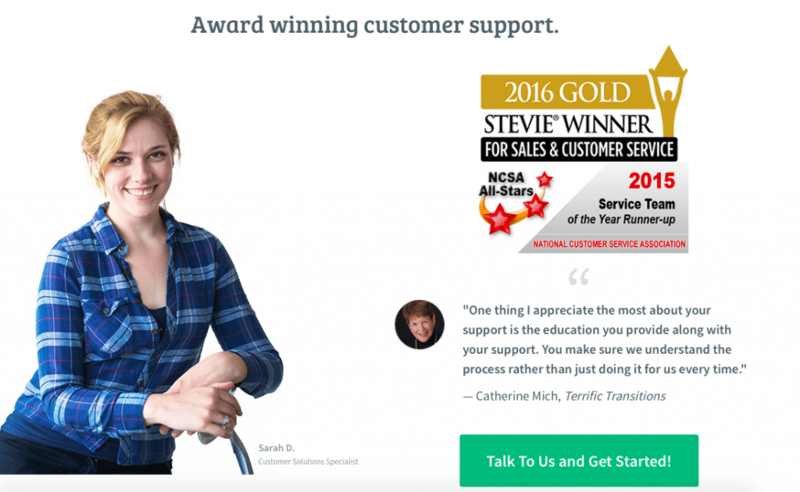 One of the primary reasons for AWeber’s stellar reputation online is because of their “award winning customer support”. Once again, this is not a criticism of ConvertKit. It’s just that AWeber places special value on customer support and goes the extra mile to ensure its new as well as existing users understand the platform and its various features completely. AWeber’s knowledge base can help you find instant answers to frequently asked questions. In addition to this, there are tons of free live webinars and video tutorials where you can learn new tricks and get better at email marketing. You can also tune into their Twitter chat #EmailChat which they host every Wednesday. It’s one of the longest running business chats on Twitter and you can gain new insights into email marketing and blogging. AWeber integrates with a wide array of third-party tools and services, allowing you to easily merge your email marketing campaigns with the rest of your business tools. AWeber has been in business for almost two decades, making it easier for them to develop an API which can easily integrate with other online services. On the other hand, ConvertKit has 80+ integrations, but it still has a long way to go before it can catch up with the level of integrations that AWeber has. For instance, one of my favorite landing page builders, Landingi, still has no integration with ConvertKit. By now, you probably know about the strengths and weaknesses of both these email platforms. If you value customer service, better overall reputation, and price, you should go with AWeber. You’d presumably have to compromise on design of email templates. On the other hand, if you prioritize ease of use, advanced automation options, and a cleaner interface over pricing, then opt for ConvertKit. Hope you found this comparison article useful. If you did, please share it on Twitter using the link below. Sandeep: Have you tested MailerLite? Several of my fellow Mastermind members are using ConvertKit.